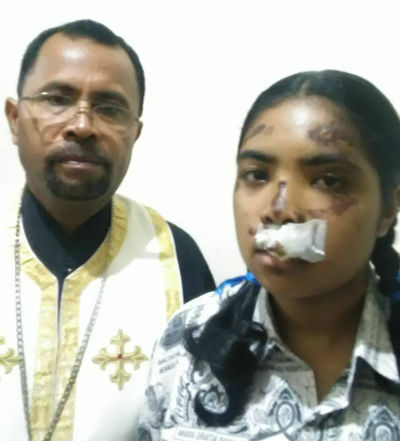 Fr Aleksander's daughter needs treatment now. Please help. Today I got some disturbing news from the ROCOR mission in Bali, Indonesia. A young girl – a ROCOR priest’s daughter - is suffering a serious medical emergency. I pray you can help her now. If you are subscribed to our Facebook updates, you may have seen that a few weeks ago thanks to your kindness, we’ve been able to help the priest Fr Aleksander Kobesi pay for the medical treatment of his young daughter, Mary Grace. Here’s what happened. Sixteen y.o. Mary Grace was driving home from school on her moped and there was an accident… She hit her head hard on the asphalt, and seriously hurt her face, one foot, and hand. As far as I understand, in Indonesia you do not get treated if you can’t pay for it. Matushka Viktoria and Father frantically ran around asking friends and neighbors for financial help. When they collected enough money, they had Mary Grace treated. She had stitches, and stayed at the hospital for three days. Thanks to your generosity, we’ve been able to help Fr Aleksander repay the loan to his friends. Fr Aleksander doesn’t have the money to send her in for a CT Scan. We only need to collect $450! Please help today! Any surplus will go to help the family and this tiny but growing mission. P.S. Please, don’t wait. A young girl’s life might be at stake. Mary Grace: CT Scan results are in!